* Book a 7 night stay and 1 of your nights is FREE when you stay at a Sandals Resort for your wedding anniversary. 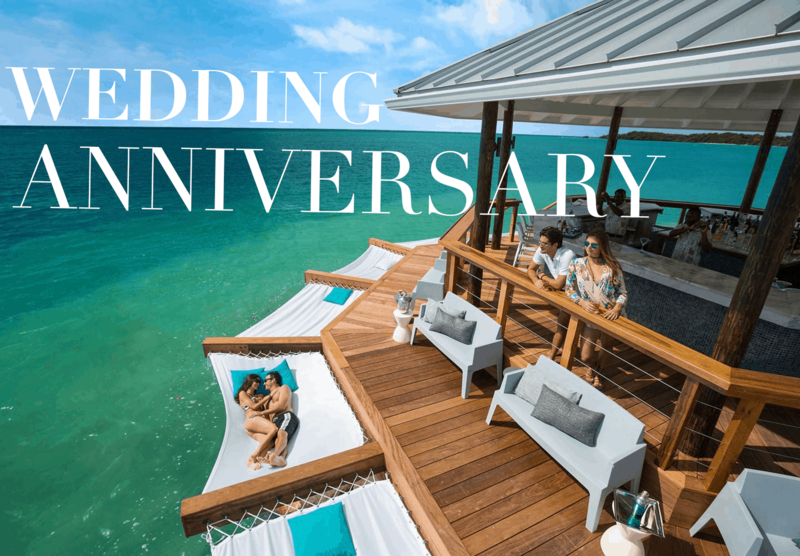 Book 7 nights or more and get 1 night free when you stay at a Sandals Resort for your Wedding Anniversary! Your wedding anniversary is an annual renewal of your promise to one another. Sandals Resorts adds that special, inspiring Luxury-Included touch, and ensures memorable anniversary vacations by offering unique experiences and world-class inclusions. No other resorts in the world are so completely dedicated to two people in love. Boasting the most romantic and imaginative suites in the Caribbean, stunning beaches, personal butler service, romantic candlelight dinners and more, you and your significant other will be encircled by comfort every day. *One anniversary night free with minimum 7 booked nights. This offer is ONLY available in the Club and Butler level room categories. Not applicable at Sandals Inn. This offer is not combinable with any other "free night" promotions or with bookings and offers made at the resort Loyalty & Travel Desk.